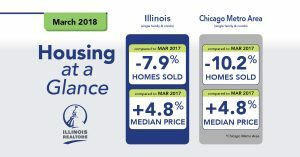 Buyer demand is strong heading into the spring housing market, but lower inventory continues to be a drag, driving sales lower and median home prices higher in March, according to Illinois REALTORS®. Statewide home sales (including single-family homes and condominiums) in March 2018 totaled 12,455 homes sold, down 7.9 percent from 13,528 in March 2017. The statewide median price in March was $199,000, up 4.8 percent from March 2017, when the median price was $189,900. The median is a typical market price where half the homes sold for more and half sold for less. The time it took to sell a home in March averaged 65 days, down from 68 days a year ago. Available housing inventory totaled 48,834 homes for sale, a 12.6 percent decline from March 2017 when there were 55,863 homes on the market. Beginning this month, Illinois REALTORS® is breaking down housing data by Metropolitan Statistical Area (MSA). The federal government uses MSAs to group together counties which have close economic ties. Illinois REALTORS® MSA reports only include counties which are in the state. The additional data is being included to allow a fuller picture of the housing market in defined economic regions. According to the data, home sales in the Bloomington MSA (McLean and Dewitt counties) totaled 204 units, a 2.9 percent decline while the median price was down 3.6 percent to $154,450; in the Metro East MSA (Bond, Calhoun, Clinton, Jersey, Macoupin, Madison and St. Clair counties) sales were down 0.9 percent to 679 units sold and the median price remained unchanged at $126,000; and in the Moline-Rock Island MSA (Henry, Mercer and Rock Island counties) sales were up 4.9 percent to 192 units sold and the median price climbed 15.1 percent to $107,000. The monthly average commitment rate for a 30-year, fixed-rate mortgage was 4.44 percent in March 2018, an increase from 4.33 percent the previous month, according to the Federal Home Loan Mortgage Corp. In March 2017, it averaged 4.20 percent. In the nine-county Chicago Metro Area, home sales (single-family and condominiums) in March 2018 totaled 8,848 homes sold, down 10.2 percent from March 2017 sales of 9,849 homes. The median price in March 2018 was $241,000 in the Chicago Metro Area, an increase of 4.8 percent from $230,000 in March 2017. “Nationally, the Fannie Mae Home Purchase Sentiment Index rose, driven primarily by a sizable increase in the net share of consumers who think it’s a good time to buy a home,” said Geoffrey J.D. Hewings, director of the Regional Economics Applications Laboratory (REAL) at the University of Illinois. According to the data, thirty-four (34) Illinois counties reported sales gains for March 2018 over previous-year numbers, including Kankakee County, up 31.2 percent with 101 units sold; DeKalb County, 22.0 percent with 122 units sold; and Macon County, up 10.2 percent with 119 units sold. Forty-eight (48) counties showed year-over-year median price increases including McHenry County, up 6.8 percent to $212,500; Will County, up 5.9 percent to $222,450; and Cook County, up 5.6 percent to $252,500. The city of Chicago saw year-over-year home sales decline 10.1 percent with 2,290 sales in March, compared to 2,546 a year ago. The median price of a home in the city of Chicago in March 2018 was $314,000, up 6.4 percent compared to March 2017 when it was $295,000. Sales and price information are generated by Multiple Listing Service closed sales reported by 27 participating Illinois REALTOR® local boards and associations including Midwest Real Estate Data LLC data as of April 7, 2018 for the period March 1 through March 31, 2018. The Chicago Metro Area, as defined by the U.S. Census Bureau, includes the counties of Cook, DeKalb, DuPage, Grundy, Kane, Kendall, Lake, McHenry and Will.